So here’s a question for people who like that kind of thing. What exactly is an evil man? Surely good and evil are simply decided by which side of an army or faction you are born into? Maybe it depends on which views you are brought up with or what you come to believe to be true on your own terms. Or is evil a more personal thing, something that is defined by your actions no matter where you come from or what your background is? Paradox Interactive’s new RPG Tyranny really poses this question to you from the get-go by allowing you to choose your backstory in the lead up to actually taking control of your character. The army of Kyros under which your loyalties lie, have taken over most of the known world aside from one small peninsula in the south. As one of Kyros’ leaders in the eventual occupation of these lands, you begin the game by deciding exactly how your armies go about capturing the district. I won’t spoil any of the important choices for you, as this intro literally shapes the game you play and choosing the level to which your evil or mercy extends is half the fun of the early game. What I will say is that as with other Paradox games the writing and character development in Tyranny is of a very high standard. Rarely does it feel like you’re reading a piece of filler text but instead insightful and interesting dialogue and backstory, and taking part in decisions that literally shape the game and characters you are playing in and talking to. Just be prepared to do a LOT of reading. If reading is really not your thing, then I would seriously consider your attitude towards this game as skipping text would, in my opinion ruin the enjoyment of the overall game. In a majority of games in this genre party interaction is something that I often find tedious and an endeavor that has no meaningful outcome. 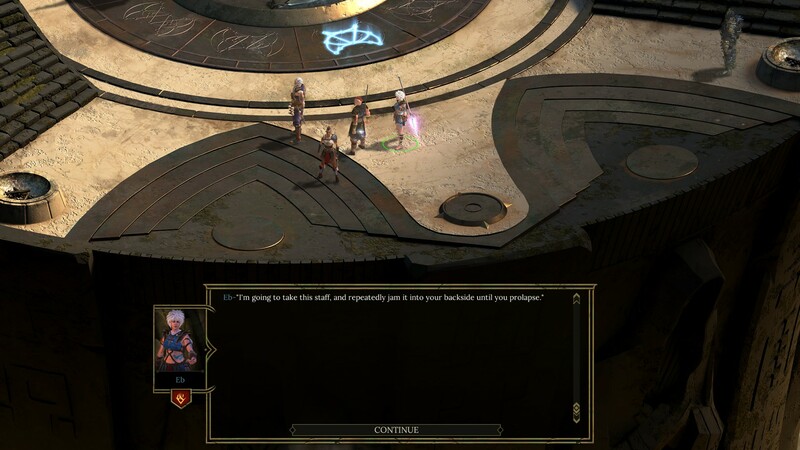 Party conversations in Tyranny however hold weight as each character that you talk to will react differently to you depending on your choices in game and the ways in which you interact with them on an individual level. You can gain fear or loyalty from them, making their own actions change according to yours. This is the same for larger factions and NPC’s in the game, who you can also gain and lose reputation with depending on your actions. This certainly makes conversation choices a lot more meaningful for me and means if you want to role play the evil guy you better be prepared to deal with the consequences. The only disappointment from the party members is that there is not a whole lot of depth to them after conversation. You may visit an area in the game that they have a connection with and they will hardly even talk. There’s also not much in the way of ‘loyalty quests’ or anything to connect them personally to these places and I feel like they lack a bit of depth in that department, which is a shame. A personal quest or two that included each of the characters you can add to your party would go a long way to solving this problem. The voice acting is also of a high standard when it shows, but not all interactions are voiced. I’m not sure if this was due to me playing the early review release of the game which im told would be missing the odd bit here and there or if they decided that it just wouldn’t be practical to have every section of the game voice acted. Certainly the main story line arc was mostly voice acted and if I think about it long enough that’s probably enough for me. The writers don’t shy away from being in your face about their characters feelings. There’s a lot to take in to account when getting into your first few proper combat situations in Tyranny, although if you have played Paradox’s other game Pillars of Eternity, you will feel semi-familiar here. Once you build up a party and level them to suit your play style things get a little easier, but initially I found it a touch hard to manage the ability overload you are faced with. There is the option to let AI manage your party members but this is best turned off if you’re thinking about tackling one of the harder difficulty levels as sometimes they can be infuriatingly slow to react, especially when switching between targets that are further apart from each other. Thankfully you can pause combat and manage each characters abilities and if things are moving to fast for you in real-time, there’s an option to toggle slow combat speeds. Once you get into the thick of the stats, abilities and equipment management, it’s actually quite enjoyable if you like that kind of thing. The spell system allows you to essentially create your own spells and assign them to any character, with higher cost spells being restricted to characters with high lore values which are normally casters anyway. Spells are created with a ‘Core Sigil’ deciding what element or type of spell it will be, an ‘Expresion Sigil’ deciding how the spell will effect the target and an ‘accent’ which modifies anything from casting range to the strength of the spell or how long the effect of the spell will take place for. Each sigil has a lore value and this is what restricts you from just giving the strongest spells to every character. For your mage assuming you have one in your party, spell creation is something of a strong point in the game, allowing you to entirely shape the type of combat style you want later into the game once you’ve collected a lot of sigils. On top of the spell system each character has their own skill tree with multiple options from which they can learn new abilities or improve combat traits like armour penetration or health. Certain pieces of equipment can also provide abilities but are mostly for stat improvement and aesthetic value. Overall the combat and ability system is fairly in depth and as a person who enjoys tweaking optimal stats and abilities I enjoyed the system that Obsidian have put in place here, certainly when compared to other games of the same genre which almost seem to shy away from making these things in any way complicated for whatever reason. In a game that isn’t entirely about combat it makes sense not to completely overload the player with combat based decisions and I feel this medium depth level worked well at not spoiling my enjoyment of everything else that Tyranny has to offer. I really enjoyed the medium level depth of the combat, skill and ability system in Tyranny. 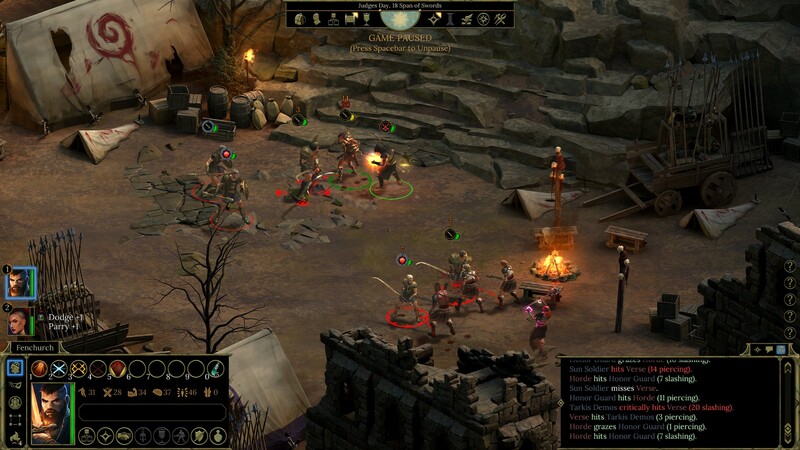 Graphically and in terms of level deign Tyranny is a really good looking game much on the same terms as Pillars of Eternity, which makes sense when you take into account that the same team developed it and it’s made with the same engine. The levels are really well designed both visually and the way in which they can be transversed and interacted with. It’s almost as if concept art has been improved upon by artists and designers leading to some stunning scenes and intelligent design. Throughout the whole game I don’t think there was a single area of the game where I thought the designers had slipped in quality. Ultimately Tyranny is a game about making decisions and unlike some games who promise a lot it really makes these choices count. During my play I compared my choices and outcomes to that of a friend and I’m happy to say that there was no illusion of choice, your actions really do change things like the people you meet, the areas you visit and smaller sub areas that you may or may not have access to, how people react to you, what people call you, items you find in the game and probably much more than that. To sum things up Tyranny is a well designed and enjoyable RPG that makes decisions count, has enjoyable combat, interesting characters and well written dialogue. It places itself in a fairly unique setting and certainly makes being evil a lot of fun. Above all of that I think the thing I like most about Tyranny is that it’s not very often in a game that I get to actually make the decision I want. In most other games I may be provided with options but certain game world rules mean that none of them suit exactly what I want to do in that situation. In Tyranny however I can happily kill off an NPC, slap someone in the face, throw them off a building, show mercy, save their life, take a bribe, or basically anything I want if I deem it necessary as I am literally the law bringer and in the end this is what makes it most enjoyable for me. Please see this post for more on our scoring policy. Steam review code supplied by PR.